We saw this on the way back from Bembridge the other day. 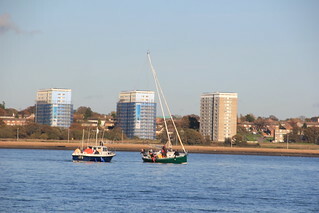 It looks like the green yacht had gone aground, on a falling tide, and the RYA boat had stopped by to assist. There was not much I could do in Arctic Rose, as I'd not be able to get close enough to be of any help. From what we could see, the RYA boat pulling on the mast to reduce their draft was not working. As things were, the tide did not have that much more to go out, and the bottom is not rocky anyway, so the vessel itself seemed to be in no real danger. Adverse weather has kept us tethered alongside at the marina this weekend. Trying to venture out in force eight or nine winds just does not make any kind of sense at all. Fortunately, there is plenty for me to post on from recent events. Here you see a picture of a flotel we encountered while in Bembridge, IOW. I had no idea such accommodation existed before the other weekend. It's worth looking at their website, as their accommodation looks pretty good. We did not go in, so can't tell you first hand if it's any good or not. The idea sounds fun though. Last Sunday there was no significant wind about. 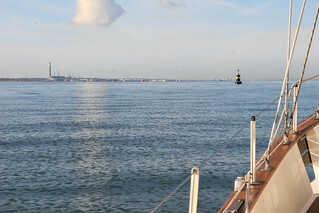 The picture shows the Solent had just the tiniest dimples in the water, not even any ripples or waves about. With no wind, of course, we had to motor all the way back from Bembridge. I know this sailing lark is not for everyone, but I cannot adequately describe that feeling of tranquility that descends on Arctic Rose as soon as the engine is shut off and the wind takes over. I think it's something to do with harnessing the power of nature, as mankind has done for hundreds of years before, plus the fact that the boat is so much quieter under sail. Obviously the calm atmosphere is somewhat reduced as the windspeed and waves pick up, but still. So we made it to Bembridge on the Saturday. We had very little wind, and what we had was right behind us, so we ended up motoring all the way round there. Mostly because I wanted to catch the tide just right at the harbour entrance. I had been a little concerned about the approach, but in the event all was pretty straightforward. 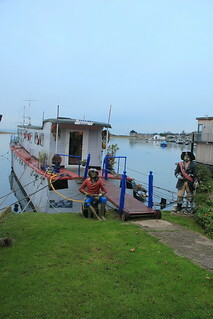 Being winter, there was also loads of room for us on the pontoon when we arrived. As things turned out, we loved the place. Amongst the high points was a fantastic evening meal at the Crab and Lobster. I'd say it's well worth a visit, and the walk, if you love shellfish. 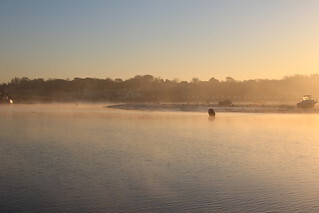 Bembridge is also so incredibly photogenic, with all the houseboats and other interesting harbour stuff going on there. We will have to go back again sometime soon. The grand plan was to go sailing round to Bembridge on the Friday, stay over exploring the area on the Saturday, then sail back on Sunday. 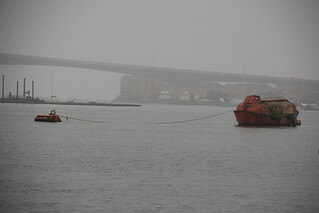 As you can see the poor visibility, with worse forecast later, stopped Friday's plan dead in it's tracks. Arctic Rose is well enough equipped to deal with poor visibility if we encounter it, with both radar and AIS on board, but I'd rather not set out into such conditions in the first place. To the right of the picture, you can also see a somewhat tatty looking lifeboat which had appeared on what was Lilagina's mooring. It should be obvious, but it is not always the case, that the great thing about starting to travel more on Arctic Rose is the increased range of interesting things there are to see. I sometimes wonder if I will ever take this for granted. I hope not. Anyway, here is Medusa. Seen at Hasler just as she was leaving to cross over to Portsmouth to participate in the rememberence day event held there. Medusa has obviously had a lot of time and money spent on her. She looks fantastic. We were round at Portmouth this last weekend, having motored around from Southampton with friends Bill and Jenny for company. Bill was one of Lady Jane's stalwart supporters, and put in more than his fair share of time afore the mast. 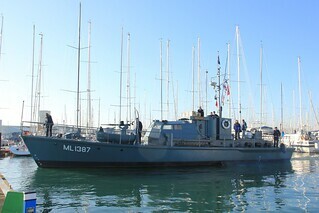 Unfortunately there was just not the wind to hustle Arctic Rose along at any kind of sensible pace, hence the motoring. It goes without saying that I so much prefer the tranquility of sailing. 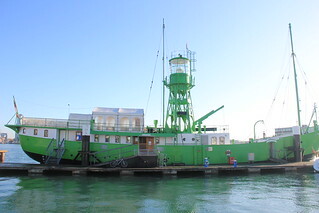 On arrival, we had ourselves a few drinks and lunch at the Lightship right there in Hasler marina. I've been gently reminded by several people recently that my blog has been abandoned and that maybe it's time to do something about it. 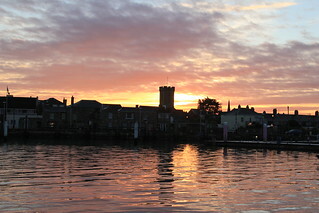 By way of getting started, here's sunrise over Yarmouth, from the deck of Arctic Rose, taken a few weekends ago.